The Cozzoli GW24 Batch Vial and Ampule Washer brings you high volume, customizable, digitally controlled washing and is built to last. This vial washer can be loaded either by hand or in batches, and can clean up to 10,000 containers per hour. This batch washer operates by descending the glassware over the perfectly centered washing needles as the lid closes, so the needles do not touch the vessels at all. The GW24 has 6 valves with three 1” lines for liquid wash media and 3 ½” lines for clean compressed air, steam and outside wash. This ampule washer is sturdily constructed of 316L stainless piping with sanitary connections, 316L basin and top cover, and the frame is 304 stainless steel exterior surfaces with an aluminum base frame. 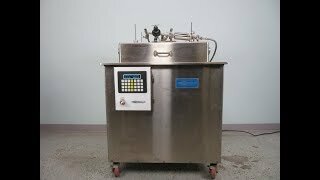 This microprocessor controlled batch washer can be operated from the upfront key pad where users can set their parameters and wash times, store protocols and purge liquids. This Cozzoli GW24 Batch Vial and Ampule Washer has been fully inspected and is performing to expectations. All of our lab equipment comes backed with our standard warranty. Should you have any questions, please don't hesitate to contact us.